While exploring Disney World’s Animal Kingdom last week, we wanted to do everything we could to immerse ourselves in everything that Animal Kingdom had to offer. Becoming “one” with the park and with the animals was a great way to celebrate Disneynature’s newest release, Monkey Kingdom, and it was an incredible experience! One of the best ways to get a chance to see all of Animal Kingdom? Through the Wilderness Explorers program! Animal Kingdom’s Wilderness Explorers is a free program that encourages explorers to explore the entire park while completing challenges and earning adventure badges while learning more about the animals within the park! Follow in the footsteps of Russell and his faithful dog, Dug, from the Disney•Pixar film Up! Jaunt across jungles, furrow into forests and make way through the woods while you set out on a series of fact-finding challenges. Think you know the wilderness? Prove it! Dozens of self-guided activities await your arrival, with missions ranging from animal observation to learning all-too-important nature skills. Each of the challenges has been scattered somewhere altogether different, so start exploring and get ready to experience Disney’s Animal Kingdom Theme Park in an all-new way! I have been to Animal Kingdom with my family before, and while we had a great time, we missed out on a lot that the park had to offer! After having experienced the Wilderness Explorers program, I am so excited for our next visit because I know that my whole family will enjoy becoming Wilderness Explorers just like Russell and Dug! 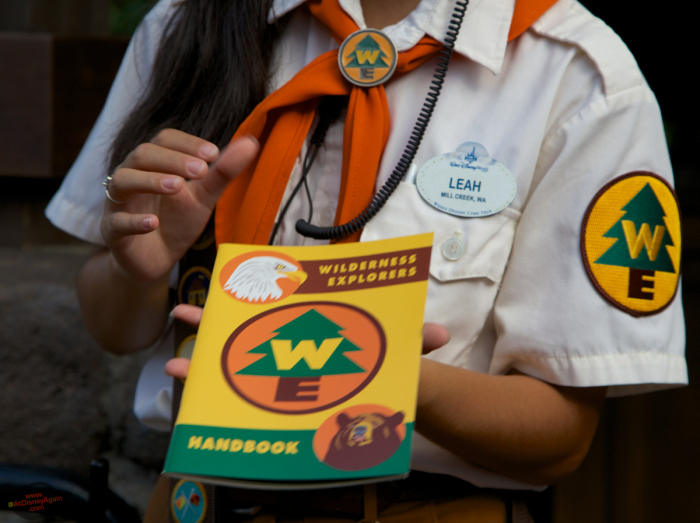 Collect over 30 badges and earn the right to echo the Wilderness Explorer call—“Caw! Caw! Roar!” But there is no need to rush! If you don’t complete all of the badges in one day – or even a whole stay – you can pick up wherever you left off any time! With so many activities at hand, completing them all may take you more than just a single visit. But no matter the challenges ahead, never give up—a true explorer knows the search for adventure continues long after your day at the Park comes to an end! You can start your animal adventure now – even before your next trip to Disney World by heading to your local theater and watching Disneynature’s newest film, Monkey Kingdom! Plus, when you go during opening week, Disneynature will make a donation to Conservation International to help protect monkeys and other endangered species in their natural habitats!